"We wanted our reception in a tipi, but didn’t fancy dragging our guests through a potentially muddy field or asking them to camp in tents. The quayside at Cardigan fit the bill perfectly, stunning setting, lots of local accommodation for all budgets, great food and the freedom to do what we wanted with the venue. It was just perfect!" "The fforest quayside is such a special place and it was clear our guests were enjoying themselves, and could see why we’d dragged them from all ends of the UK to Mid Wales!" "As we walked through the quiet little passageway into the Fforest quayside courtyard, we were hit by barbecue smoke, sunshine and an almighty roar of cheering from our guests, the drinks were flowing and the atmosphere was just unbelievable it stopped us in our tracks it was electric, we couldn’t believe our luck with the weather!" Huge thanks to Natasha and Matt for letting me feature their beautiful dreamy wedding weekend at the amazing Fforest - one of the most incredible venues we’ve had the honour of featuring on Green Union. "The whole weekend was spent at Fforest, surrounded by the most beautiful countryside with our friends and family - everyone, including our lovely photographers, stayed in amazing yurts, bell tents and geodesic domes." "We wanted a temporary village of all our friends and family with a relaxed sense of community." "fforest is rooted deep in the countryside and provides local seasonal foods. Even our flowers were grown in Wales and hand picked by us two days before the wedding from Flower Hive." "To kick off we had canapés with champagne, then afternoon tea followed by a lamb spit roast in the evening and wedding cake, later we had kebabs at 11pm for the hungry. All the food was locally sourced and beautifully cooked by the team at Fforest." Adam and Gemma’s wedding was last year at the very quaint fforest, Manorafan, a wedding venue that I absolutely loved! fforest is owned, managed and adored by James and Sian who left London careers and moved to Wales in 2004 looking for a lovelier, wilder life. fforest opened to guests in 2007 and hosted the first of many weddings in 2008. To continue the anniversary celebration, fforest have put together an amazing photography offer for couples booking a 2017 wedding. They’ve invited some of their favourite wedding photographers – Aga Tomaszek, Marshal Gray, Debs Ivelja, Tim Bishop, Igor Demba and the legendary Laura Babb – to photograph fforest weddings without any cost to you! The 200 acres of fforest farm are part of an area of unspoilt natural beauty, wrapped in woods, wildlife and wonder. The farm is flanked on one side by the Teifi Marshes nature reserve and on the other, Cilgerran gorge, through which the magnificent river Teifi flows down to the local town of Cardigan and the Irish sea beyond. fforest farm is the perfect location for a relaxed, informal, weekend-long celebration with family and friends. It’s yours for the weekend with its choice of event spaces from giant hat tipis, dining and party barns, garden pavilion, private tiny stone pub, large communal firepit and secret woodland sauna. The farmyard is the perfect spot for an intimate winter wedding of up to 40 guests, or can combine with the cedar barn for up to 250. From April to October fforest host larger weddings for up to 250, offering a flexible combination of celebration spaces. Choose between outdoor festival or indoor hygge. fforest work with you to accommodate larger informal weddings of 250+ taking full advantage of all the spaces available to you, adding a bespoke tented festival village to house the additional guests. 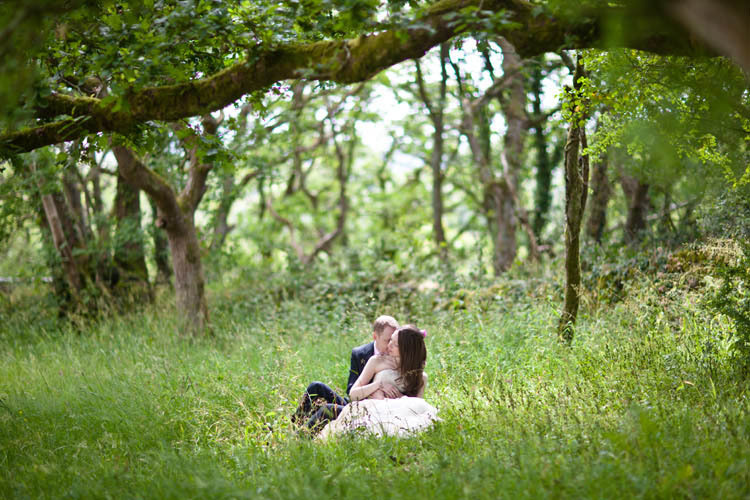 A campsite in Wales played host to Maria & Chris’ fabulous wedding. With the help of their friends & family the couple pulled a lot of the wedding together themselves.